The Siberian Traps are spewing lava and the BIG DIE is coming. 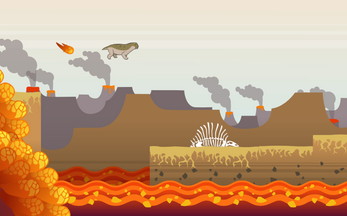 Only with your help will Lystrosaurus reach the Triassic. Press <space> or <mouse click> to jump. Touch the lava to join the BIG DIE. Made for Paleontology Coproliteposting Facebook group - join for the freshest paleomemes. Hi there, I stumbled across a link to your game on the Beasts of Bermuda discord, and made a little video of it. (Alas, I have no idea if or where there's a private messaging system over here, which is probably more polite but I can't find it so comments section it is.) Thank you for making it!